Fourth grade students at Northfield Elementary School played a Jeopardy!-style game, led by school librarian Nanette Smith, that featured questions about Peter Brown's novel "The Wild Robot." 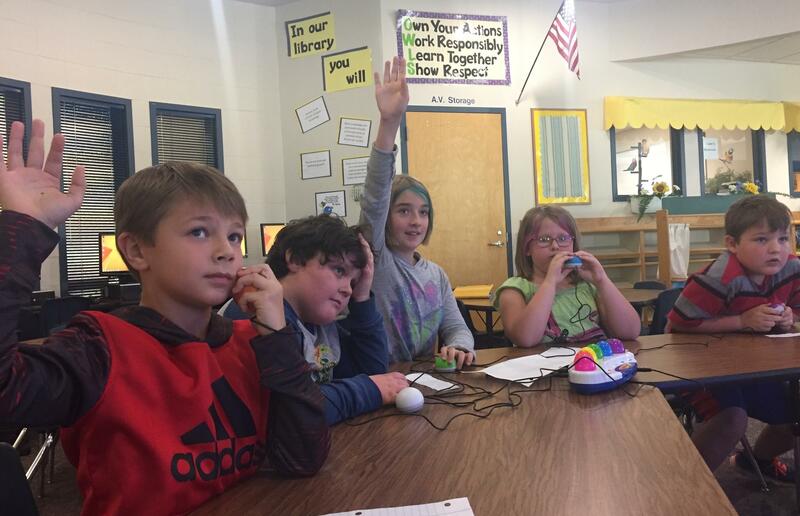 School librarian Nanette Smith had a Jeopardy!-style game set up on a screen, and students filed in to play, taking seats near devices that would allow them to buzz in with a light-up egg if they wanted to take a go at the answer. Each game category corresponded to an element of The Wild Robot, written and illustrated by Peter Brown. He has published a lot of picture books, but The Wild Robot is Brown's first novel and it's one of the nominees for this year's Dorothy Canfield Fisher award. While there are no people on the island that Roz encounters in the story, there are lots of other inhabitants – including otter, geese, bear, beaver and deer. And Roz, who’s able to learn and to communicate with the animals, must figure out how to survive. After Roz powers up on the island, she has a lot to learn. But Roz is good at taking lessons from the animals who live there. For example, she learns how to climb up rocky ledges from a deft crab and she learns the art of camouflage from a stick bug. It's a wild adventure and one of these Northfield fourth graders wanted to know how the author imagined it all. Anastasia Rhodes: "How did you come up with the idea for this book?" 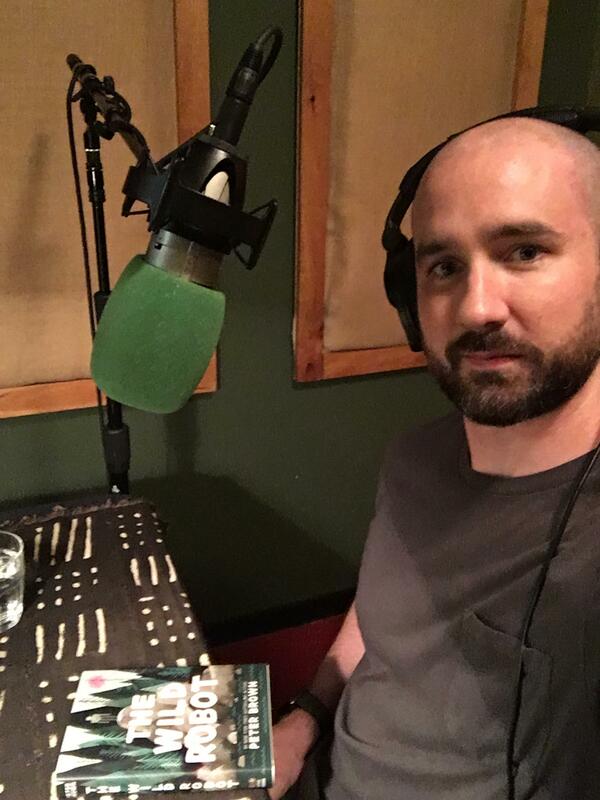 Author and illustrator Peter Brown sits in a studio in New York City where he answered questions that Northfield Elementary School students asked about his book "The Wild Robot." Peter Brown: "The idea for The Wild Robot came while working on another book, actually, called The Curious Garden. The Curious Garden is about a boy who lives in a grey, dreary city and he discovers a few weeds and wildflowers growing in a forgotten corner. And he starts taking care of them, and he does a great job. And these wildflowers and plants start spreading across the city. "And so I spent a lot of time thinking about natural things in unnatural places. And then I started thinking about unnatural things in natural places. And the most unnatural thing I could think of was a robot. And the most natural thing I could think of was the wilderness. "When I put those two ideas together, it kind of felt like there was a story there that needed exploring. So that was where the initial idea for The Wild Robot came from." That explains how the story came about, but another fourth grader wanted to know why it did. James Wright: "Why did you write this book?" Peter Brown: "I wrote this book because I had to write this book. The ideas I had about a robot learning to survive in the wilderness were just so exciting and so interesting, and led to so many new ideas and new characters and new situations, that I had no choice. As an author and an illustrator, I just felt like this book needed to exist and it was up to me to create it." Northfield Elementary School fourth graders - from left, Aiden Boyle, James Wright, Anastasia Rhodes, Braelyn Delmas and David Myer - participate in the trivia game. During her adventures on the island, Roz comes to adopt an orphaned egg, out of which hatches a gosling. She names him Brightbill and learns to take care of him. One student was curious about those two main characters. Jared Ashford: "What made you come up with Roz and Brightbill?" Peter Brown: "Well, I needed a robot character for my robot nature story. So I invented a robot character named Roz. I could have named her anything, I guess, but Roz seemed like a good name to me. And it’s a little bit of an homage to the very first robot story ever told, which was a play called Rossum's Universal Robots. "In my story the robots are called Rozzums instead of Rossum, so that was part of the reason for naming Roz, Roz. And I knew that, as part of her experience in the wilderness, I thought it would be great for her to experience family of some sort. So I had to find a way to give my robot a family. And I invented Brightbill, an orphaned gosling who she adopts as her family." 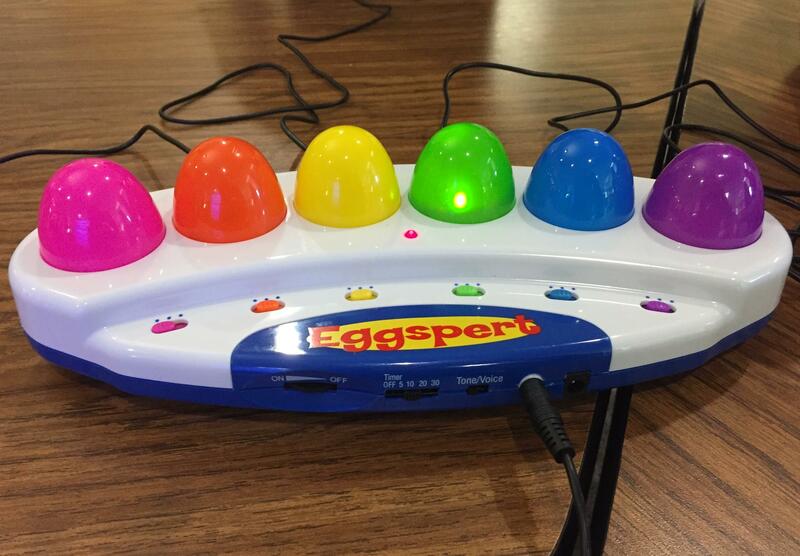 When students knew an answer in the "The Wild Robot" trivia game, they buzzed in and their color would light up on the "Eggspert" device. Mariela Swiech: "Where is the island located? And what time period is it — future or past?" Peter Brown: "I don't specifically say where the island is or at what time the story takes place, for a couple of reasons. One is: I like the idea that kids from around the country, or even around the world, could kind of imagine this place being not too far away. I mean, the island’s certainly not tropical. But maybe it's off the coast of Alaska, or Canada, or Scotland, or Norway, or Russia. Or maybe someplace in the south, off the tip of Chile, or something like that. I didn’t want to get super-specific, so I didn't. "And the time period isn't very specific either. I will say that, if we have these advanced, intelligent robots running around, it's probably not in the past, or the present. Probably the future. Maybe even far in the future." From left, Jared Ashford, Aiden Duquette, Parker Sanders, Mariela Swiech and Kennedy Perrigo gather near their "Eggspert" machine, which they used to buzz in when they knew an answer in their trivia game about "The Wild Robot." In addition to questions about the plot of the The Wild Robot, another student expressed curiosity about Brown's career. Kennedy Perrigo: "How did you become a famous writer?" Peter Brown: "I like the way you phrased your question, Kennedy. Ah, I don’t know if I’m famous or not, but I am definitely a professional author and illustrator. But I’ve always loved writing. I’ve always loved drawing and coming up with stories and characters. I’ve really been doing this my whole life. "And, eventually, over time, I got better at these things. And eventually, over time, I became good enough to do this professionally and get paid to write stories and draw pictures." Brown says writing The Wild Robot and creating the illustrations went hand-in-hand for him. "The way that works is I look at a sketch and I say I want to make a finished illustration that looks kind of like this sketch. So I start painting simple shapes with ink on paper. I start drawing simple shapes with pencil on paper. Then I scan those simple drawings and paintings and get them into my computer. And I start collaging them together in my computer. "And eventually I end up with this computer file, this art file, that has all these layers with all these shapes layered over top of each other. I start coloring each shape individually. And, eventually, every shape is in the right place, and it’s the right color, and I have a finished illustration." Mariela Swiech writes on the board keeping track of the students' scores for the game, while librarian Nanette Smith looks on. If it sounds like that takes awhile to complete, you're right. And one Northfield student was looking for some specifics. Peter Brown: "I spent about five years making picture books – a bunch of different picture books – and in my free time, working on The Wild Robot. And then at the end of that five-year period, I spent about a year-and-a-half working on The Wild Robot and nothing else. "So it's a little hard to say exactly how much time I actually spent on the book, 'cause it was spread out over six-and-a-half, seven years. Something like that. But it was a long time." These fourth graders may have finished The Wild Robot, but it sounds like it won't be the last that readers hear from Roz, as evidenced in the answer Brown gave to one student's question. Parker Sanders: "Are you going to make a sequel of the book?" Peter Brown: It's called The Wild Robot Escapes and it will be out in March of 2018." Find more episodes of Dorothy's List here.